Updates on Seth Rollins, Sasha Banks, and AJ Styles, the date of the WWE's return to Saudi Arabia, WWE writer announces he is leaving, Superstar Shakeup in Canada, New Japan prospect leaving & lots more. **Monday’s edition of Rewind-A-Raw is available with a big rundown of Raw from Portland, the latest on Sasha Banks, the opening segment with Becky Lynch and Stephanie McMahon, Kurt Angle teaming with Braun Strowman and lots more. We had lots of news to go through with the first WWE Hall of Fame inductees being reported, the dates for the Superstar Shakeup, WrestleMania Axxess, Halftime Heat and the live streaming numbers, plus all the information for our POST Wrestling Live in New York show over WrestleMania weekend. Download the show directly or listen on iTunes, Spotify, Stitcher, Google Play or wherever you listen to podcasts. **Wai Ting and I are back tonight with Rewind-A-SmackDown going through tonight’s show in Everett, Washington and taking your feedback and questions. We will also have a second show with the weekly Double Shot for members of the POST Wrestling Café. We are planning to chat about the Worlds Collide tournament, MLW’s Superfight event, Being the Elite, and perhaps some other stuff we have caught over the past week. **A new edition of the British Wrestling Experience will be out Wednesday with Martin Bushby and Benno. They will be chatting about the latest with NXT UK, the Worlds Collide tournament, OTT Contenders 13, wXw in London, Progress Chapter 85 and more. **We have an update on Seth Rollins, who missed Raw on Monday and is said to be dealing with a back injury. As we reported over the weekend, he is not expected to be wrestling on live events for the next few weeks but is expected to show up on television as he has been cleared to travel. There is no concern regarding his status for WrestleMania as he should be good to go long before that. **The tag match on Raw with Bayley and Sasha Banks defeating Nikki Cross and Alicia Fox had to rely on smoke and mirrors with Banks because she was not fully cleared yet. We were told after the show she had not been cleared, although I was seeking clarification if she could be involved with minimal physicality. Banks was dragged from the back at the start of the segment although the whole beatdown was on Bayley. They are optimistic she will be okay by next week and are going ahead with the plan to have Banks and Bayley in the Elimination Chamber match. Later in the day, it was repeated to us that Banks has not been cleared. **Sean Ross Sapp at Fightful is reporting that the WWE’s return to Saudi Arabia is scheduled for Friday, May 3rd. There was no specific city or venue listed in the report. 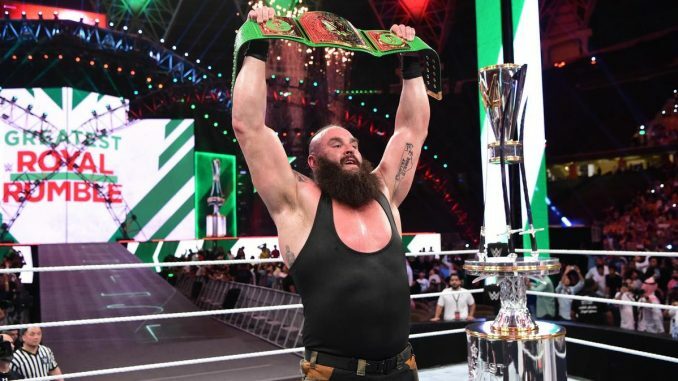 It would be the WWE’s third event since signing a ten-year agreement with the General Sports Authority in 2018 following the Greatest Royal Rumble last April and Crown Jewel in November. Dave Meltzer had previously reported that the WWE had booked dates in the country in May and November this year. The first event faced criticism with a lot focused on the exclusion of female performers on the show as well as the human rights issues within the country. The actual show in Jeddah in April came off as a propaganda vehicle for the country with the announcers promoting the changes within the country and a PSA running with a similar message. The Crown Jewel event faced significantly more focus because of the murder of journalist Jamal Khashoggi in October and the WWE’s decision not to pull out from running their scheduled show in Riyadh. John Cena and Daniel Bryan were removed from the show, although neither has spoken publicly about their decisions. The event went on with the company avoiding naming the country they were in and eliminating the propaganda elements that were heavily focused upon in April. **Monday’s episode of Raw averaged 2,501,000 viewers on the USA Network and 7% drop from last week’s viewership following the Royal Rumble. The show began with 2,656,000 viewers in the first hour, it dropped to 2,552,000 in the second hour and then down to 2,321,000 in the final hour. **During the Canadian broadcast of Raw on Sportsnet 360, a WWE promo ran advertising the first-ever “International Superstar Shakeup” for Monday, April 15th and Tuesday, April 16th with Raw and SmackDown taking place at the Bell Centre in Montreal, Quebec. **Dave Meltzer reported on Wrestling Observer Radio that AJ Styles is dealing with a hernia and we were able to confirm that is the injury. He did not work the live events over the weekend. He has not wrestled since the Royal Rumble against Daniel Bryan. Over the weekend, we were told they were hopeful of Styles being cleared by tonight’s tapings but without knowing the extent of his hernia, that sounds very optimistic. I want to thank the wonderful folks at the @wwe for letting a kid get to live his dream for the past year. Never would have thought I would’ve got to write and create for something i grew up watching, and moreso, making some lifelong friends along the way. The journey was incredible, the experience was immeasurable, and the respect that I’ll have for every single man and woman that helps put this show together every week will never ever dissipate. Thank you to the incredible creative writing team for making me feel welcomed and everyone else at WWE for the hell of a ride. It’s on to the next one. **The WWE has announced that they will be celebrating Ric Flair’s 70th birthday in three weeks on the February 25th episode of Raw in Atlanta. **Sting has been announced for an appearance at Starrcast in Las Vegas this May. The second Starrcast convention will take place May 23rd to 26th in Las Vegas with the pre-sale beginning next Tuesday and general on-sale scheduled for Friday, February 15th. **New Japan Pro Wrestling has announced that young lion Katsuya Kitamura ended his tenure with the company on January 31st. Kitamura has not wrestled since last March after he suffered a significant injury. The Wrestling Observer Newsletter recently reported that Kitamura had been offered a new contract by New Japan but had not signed it. Kitamura was a highly accomplished amateur wrestler for Senshu University and was an Olympic hopeful. Those plans were out the window after he failed a drug test for drostanolone, which he stated was a result of a tainted supplement he took. He received a two-year suspension from amateur wrestling in 2011 as a result of the test findings. He trained in the New Japan Dojo and began wrestling in February 2016 on the Lion’s Gate cards and was brought to the New Japan roster in March 2017. His look was impressive with high hopes being placed upon him as a future heavyweight standout. Prior to the injury, he was placed in a trial series of singles matches losing to Jay White, Michael Elgin, Juice Robinson, Hiroyoshi Tenzan, Manabu Nakanishi, and Yuji Nagata. His last match was on the Anniversary tour last March teaming with Nakanishi in a loss to Tomohiro Ishii and Toru Yano. **Kris Wolf has announced she has been dealing with symptoms from concussions and is about to take part in her final tour and appears to be stepping away from professional wrestling. She has been talking about having her final match in London later this year and is going to fulfill her remaining bookings. She said she has noticed changes from her concussions and doesn’t want to do further damage that won’t be evident until much further down the road. Wolf has been wrestling since 2014, predominantly for the Stardom organization along with wXw, Pro Wrestling: Eve, RISE, and SHIMMER. This past weekend she worked the “Come Hell or High Water” event in Atlanta teaming with Joey Ryan, Kikutaro, and Effy against Allie Kat, Sprida, Moonshine Mantell and Steve O Reno. **The NWA and Ring of Honor will be presenting the Crockett Cup tournament on Saturday, April 27th at the Cabbarus Arena in Concord, North Carolina. On Tuesday, they announced the commentary team for the show will feature Ian Riccaboni, Jim Cornette, and Joe Galli. The latter two called the last NWA pay-per-view in October and were very good together and Riccaboni is a strong play-by-play announcer. They have added that Ricky Morton, Robert Gibson, Bobby Eaton, Stan Lane, Dennis Condrey, Magnum TA, and Nikita Koloff will be in attendance for the show. Tickets go on sale to Honor Club members on Wednesday at 10 am Eastern and to the public on Friday at 10 am. **Jonathan Snowden has a story at Bleacher Report on Ken Shamrock’s match with Tom Lawlor this past weekend for McAloon Productions in Atlanta at a bar. **Heavy Machinery’s profiles on the WWE website have been altered with the duo simply referred to as “Otis” and “Tucker” as they appear to have had their last names dropped. **EVOLVE has announced their full card for EVOLVE 122 on February 16th in Concord, North Carolina and airing on Club WWN: JD Drake vs. Montez Ford for the WWN title, Austin Theory vs. Anthony Henry for the EVOLVE title, Adam Cole vs. Darby Allin, Angelo Dawkins vs. Eddie Kingston, AR Fox vs. Shane Strickland, DJZ vs. Josh Briggs, and Harlem Bravado vs. Curt Stallion. **Alpha-1 Wrestling out of Hamilton, Ontario has announced a four-way elimination match with Kobe Durst defending the Alpha Male title against Scott Steiner, Josh Briggs and Chris Dickinson on March 10th at 222 Queenston Road at 4 pm. Tickets are $15 in advance and $20 at the door and go on sale this weekend. **Disney is attempting their regional sports networks to clear the way for a deal with 21st Century Fox worth $71 billion. Sinclair Broadcasting was reported to be one of the bidders, but CNBC reports they are now out of the process. The same report says that Sinclair could come back with a joint bid for the RSNs. The two known bidders are Major League Baseball and Liberty Media. **The WWE stock closed at $81.71 on Tuesday. **John Ourand of the Sports Business Journal reported Tuesday that according to Disney chairman and C.E.O. Bob Iger the ESPN+ streaming service currently has 2 million paid subscribers. The UFC has provided a huge boost to the platform after it was announced that there were 525,000 sign-ups on the day of the inaugural UFC event on ESPN+ last month in Brooklyn. **On Monday’s episode of Ariel Helwani’s MMA Show, manager Ali Abdel-Aziz stated that UFC bantamweight has one fight remaining on his UFC deal. Moraes put himself in a great spot within the division by avenging his loss to Raphael Assuncao this past Saturday with a conclusive first-round stoppage. Moraes should be fighting for the bantamweight title but the division in flux following champion T.J. Dillashaw’s loss to Henry Cejudo last month and Dillashaw wanting a rematch. Another interesting wrinkle is that Abdel-Aziz represents both Moraes and Cejudo, who are angling for the fight with Dillashaw. **UFC lightweight David Teymur suffered a broken right orbital bone during his fight with Charles Oliveira this past weekend in Fortaleza, Brazil. The Brazilian MMA Athletic Commission (CABMMA) has handed Teymur a medical suspension of 180 days, although can return earlier if he is cleared by a specialist.